Julian Burnett is a SAfrican music fan. He loves the pennywhistle sound and has discovered the magic of Capetown Jazz through Morris Goldberg. 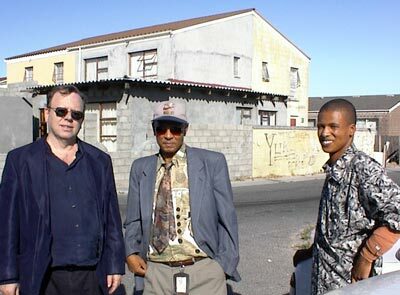 Julian first heard James Armoed playing pennywhistle while busking on St.George's Street in Cape Town, while out on a visit from Las Vegas, USA, a few years ago. Within the first few notes he could tell that James had exceptional talent. His son accompanied him on guitar and his grandson on bongos - both exceptionally talented musicians. Julian met with James & asked if he had ever recorded his music. James had previously recorded a demo tape for Des and Dawn Lindberg some years ago - but other than that, no. On his return to Cape Town last year, Julian decided to look for James & see if he was interested in recording a CD. He searched all over Cape Town i.e. at all the spots where the buskers played but to no avail. Then on his second last day in Cape Town he was having coffee at the Mozart Cafe in Church St and heard a pennywhistle playing outside - it was James. By this time James had forgotten Julian, and was very surprised when Julian called him by name. They discussed the CD idea again & James got very excited - he had tears in his eyes and said that it was a dream of his to record - He prayed for the opportunity to do a CD and was convinced that God had sent Julian. He was just sad that this opportunity had come so late in his life. Julian did a rough cassette tape recording & on his return to the USA played it for the legendary New York Malawian musician, Tony Bird who then suggested that Julian contact David Marks of 3rd Ear Music - as Tony & David have known each other for 30 years. Julian checked out the 3rd Ear Music website & called David in Durban to arrange to have a CD recorded. The rest is History - or is that Retro? As they say. Julian's involvement with Tony has been to encourage him to complete his Precious Africa CD, which he has been working on for the last 6 years. It is a beautiful CD & notable for the track that features Ladysmith Black Mambazo on Hamba Willie Hamba - about the legendary SAfrican Marathon runner, Willie Mathola - who won Gold at the Atlanta Olympics. Julian is also executive producer & backer for Morris Goldberg's new CD currently being recorded in New York with his band OJOYO - which includes 2 fellow South Africans Tony Cedras on keyboards and Bakithi Khumalo on bass - all featured on Paul Simon's Gracelands album - with Morris playing the famous pennywhistle solo on "You can call me Al". Julian first met with Morris at the Green Dolphin on one of his Capetown visits & was extremely surprised to hear that a musician of Morris's rare and exceptional talent had only recorded 2 CDs. It was then that he decided to invest in the new CD, which Morris is now recording in New York & should be completed in the next few months. Watch this Space.